Researchers are increasingly required to make research data publicly available in data repositories. Although several organisations propose criteria to recommend and evaluate the quality of data repositories, there is no consensus of what constitutes a good data repository. In this paper, we investigate, first, which data repositories are recommended by various stakeholders (publishers, funders, and community organizations) and second, which repositories are certified by a number of organisations. We then compare these two lists of repositories, and the criteria for recommendation and certification. We find that criteria used by organisations recommending and certifying repositories are similar, although the certification criteria are generally more detailed. We distil the lists of criteria into seven main categories: “Mission”, “Community/Recognition”, “Legal and Contractual Compliance”, “Access/Accessibility”, “Technical Structure/Interface”, “Retrievability” and “Preservation”. Although the criteria are similar, the lists of repositories that are recommended by the various agencies are very different. Out of all of the recommended repositories, less than 6% obtained certification. As certification is becoming more important, steps should be taken to decrease this gap between recommended and certified repositories, and ensure that certification standards become applicable, and applied, to the repositories which researchers are currently using. Data sharing and data management are topics that are becoming increasingly important. More information is appearing about their benefits, such as increased citation rates for research papers with associated shared datasets (Piwowar & Vision 2013; Piwowar, Day & Fridsma 2007). A growing number of funding bodies such as the NIH and the Wellcome Trust (NIH 2015; Wellcome Trust n.d. a), but also several journals (Borgman 2012), have installed policies that require research data to be shared (Mayernik et al. 2014). To be able to share data, both now and in the future, datasets not only need to be preserved, but also need to be comprehensible, and useable for others. To ensure these qualities, research data needs to be managed (Dobratz et al. 2010) and data repositories can play a role in maintaining the data in a useable structure (Assante et al. 2016). However, using a data repository does not guarantee that the data is usable, since not every repository uses the same procedures and quality metrics, such as applying proper metadata tags (Merson, Gaye & Guerin 2016). As many repositories have not yet adopted generally accepted standards, it can be difficult for researchers to choose the right repository for their dataset (Dobratz et al. 2010). Several organisations, including funding agencies, academic publishers, and data organisations provide researchers with lists of supported or recommended repositories, e.g. BioSharing (McQuilton et al. 2016). These lists vary in length, in the number and type of repositories they list, and in their selection criteria for recommendation. In addition, recommendations for data and data sharing are emerging, such as the FAIR Data Principles: guidelines to establish a common ground for all data to be Findable, Accessible, Interoperable, and Reusable (Wilkinson et al. 2016). Some data repositories are beginning to incorporate the FAIR principles into their policies, such as the UK Data Service (2016) and several funders such as the EU Horizon 2020 program and the NIH (European Commission 2016; NIH Data Science 2016). Lists of recommended repositories and guidelines such as these can help researchers decide how and where to store and share their data. Next to lists of recommended repositories, there are a number of schemes which specifically certify the quality of data repositories. One of the first of these certification schemes is the Data Seal of Approval (DSA), with an objective ‘to safeguard data, to ensure high quality and to guide reliable management of data for the future without requiring the implementation of new standards, regulations or high costs’ (DSA n.d. a). Building upon the DSA certification, but with more elaborate and detailed guidelines (Dillo & De Leeuw 2015), is the Network of Expertise in Long-Term Storage of Digital Resources (NESTOR) and the ISO 16363 standard/Trusted Data Repository (TDR). DSA, NESTOR, and TDR form a three-step framework for data repository certification (Dillo & De Leeuw 2015). The ICSU-WDS membership incorporates guidelines from DSA, NESTOR and Trustworthy Repositories Audit & Certification (TRAC), among others, for its data repository framework (ICSU-WDS 2012). Furthermore, the TRAC guidelines were used as a basis for the ISO 16363/TDR guidelines (CCSDS 2011). Given the multitude of recommendations and certification schemes, we set out to map the current landscape to compare criteria and analyse which repositories are recommended and certified by different parties. This paper is structured as follows: first, we investigate which repositories have been recommended and certified by different organizations. Next, we provide an analysis of the criteria used by organisations recommending repositories and the criteria used by certification schemes, and derive a set of shared criteria for recommendation and certification. Lastly, we explore what this tells us about the overlap between recommendations and certifications. To examine which repositories are being recommended, we looked at the recommendations of 17 different organisations, including academic publishers, funding agencies, and data organisations. These lists of recommended repositories are all the available recommendation lists currently found on the BioSharing website under the Recommendations tab (BioSharing n.d. a), and in a web search by using the term “recommended data repositories”. These are lists compiled by the American Geophysical Union (AGU n.d.), BBSRC (BBSRC n.d.), BioSharing (BioSharing n.d. b), COPDESS (COPDESS n.d.), DataMed (DataMed n.d.), Elsevier (Elsevier n.d.), EMBO Press (EMBO Press n.d.), F1000Research (F1000Research n.d.), GigaScience (GigaScience n.d.), NIH (NIH n.d.), PLOS (PLOS n.d.), Scientific Data (Scientific Data n.d.), Springer Nature/BioMed Central (both share the same list) (Springer n.d.), Web of Science (Web of Science n.d.), Wellcome Trust (Wellcome Trust n.d. b), and Wiley (Wiley n.d.). All lists, including links to the online lists, were compiled into one list to compare recommendations (http://dx.doi.org/10.17632/zx2kcyvvwm.1). Not all data repositories indexed by the Web of Science’s Data Citation Index (DCI) were included as there is no publicly available list with all repositories indexed by the DCI, so retrieval of recommended repositories was done through an individual search. The repositories indexed by Re3Data were not included in our list of recommended repositories as Re3data functions as “a global registry of research data repositories” (Re3Data n.d.) and thus does not recommend repositories. However, Re3Data was used to verify the repository’s status, persistent identifiers, and obtained certifications. For our analysis of data repository certification schemes, we examined five certification schemes. These were the DSA, ICSU-WDS, NESTOR, TRAC, and ISO 16363/TDR. These schemes were chosen due to being used for certification (DSA, ICSU-WDS, NESTOR and ISO 16363/TDR) or as a self-assessment check for repositories (TRAC). Both the DSA (DSA n.d. b), ICSU-WDS (ICSU-WDS n.d.) and NESTOR (NESTOR Seal n.d.) provide lists of certified repositories on their respective websites. ISO 16363/TDR certification has not yet been awarded (Larrimer 2016). We consulted the websites of the DSA, ICSU-WDS, NESTOR, TRAC and ISO 16363/TDR certification schemes to see which repositories they certified. The results were compiled into one list (https://doi.org/10.17632/zx2kcyvvwm.1). 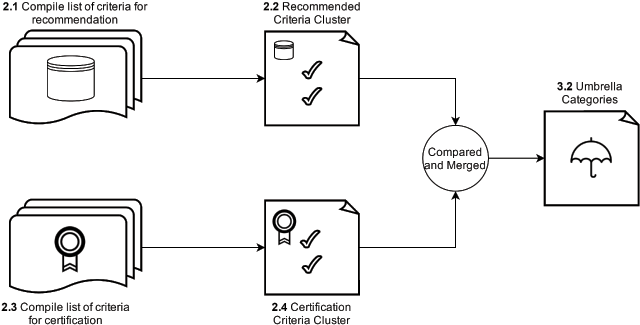 After composing the list of recommended repositories, we investigated which criteria are being used to determine a recommendation or certification, and whether an overlap exists between recommended and certified repositories, and the criteria used (Figure 1). Flowchart of the methodology used to create the umbrella categories. These steps will be discussed in turn. To understand the motivation behind specific recommendations, we looked at the organisations’ selection criteria for their lists of recommended repositories. Four of the 17 organisations supplied criteria for this online alongside their lists: BioCADDIE, F1000Research, Scientific Data/Springer Nature (SD/SN), and Web of Science (WoS). The Research Data Alliance’s (RDA) criteria for recommended repositories were also included in this analysis. Although the RDA does not maintain a list of recommended repositories, we included their criteria to balance out the weight between the number of organisations that recommend repositories, and the number of organisations that provide criteria for certification. The criteria of the five organisations were then compiled into one list (https://doi.org/10.17632/zx2kcyvvwm.1). We categorized the criteria into 15 subheadings: Recognition, Mission, Transparency, Certification, Interface, Legal, Access, Structure, Retrievability, Preservation/Persistence, Curation, Persistent Identifier, Citability, Language, and Diversity of Data. These subheadings were derived from recurring and shared subjects throughout the different criteria lists. We then filtered out repetitions, or criteria unique to one organisation, namely Language and Diversity of Data, to create the “Recommended Criteria Cluster”. We consulted relevant websites to obtain the criteria used by the DSA, ICSU-WDS, NESTOR, TRAC and ISO 16363/TDR certification schemes and compiled a list of all certification criteria of the five schemes. In the case of the DSA (DSA n.d. c), ICSU-WDS (ICSU-WDS 2012) and NESTOR (NESTOR 2012), these were found through their respective websites. The criteria for TRAC were found through the website of the Center for Research Libraries (CRL)(CRL and OCLC 2007), and the criteria for the ISO 16363/TDR were found through the Primary Trustworthy Digital Repository Authorisation Body, on the website of the Consultative Committee for Space Systems (CCSDS 2011). To see whether there was overlap between the lists of recommended and certified repositories, we gathered the lists of repositories issued by the certifying organisations, and compiled these results into one list (available here: https://doi.org/10.17632/zx2kcyvvwm.1). We then calculated the number of times a repository was recommended by the different organizations as well as the percentage of recommended repositories with and without certification. We compared the Recommended Criteria Cluster and the Certification Criteria Cluster by looking at commonalities and recurrences between the two sets of broader headings and its constituents. We matched headings such as Community together with Recognition, Access with Accessibility, and Technical Structure with Interface, to derive a higher-order cluster of categories, which we are calling “Umbrella Categories”. This was done to create broader terms that are relevant to both recommendation and certification criteria, to further ease the process of qualifying repositories. In the process of matching terms, those that were identical were left as is, e.g. Mission, and Retrievability. Next, we classified every recommended repository into one of five disciplines, to analyse if a relationship exists between certification, recommendation, and discipline. The disciplines we identified – General/Interdisciplinary, Health and Medicine, Life Sciences, Physical Sciences, and Social Sciences and Economics – were based on the focus disciplines provided on the websites of Scientific Data/Springer Nature, PLOS, Elsevier, and Web of Science, as these organisations provided comparable lists of disciplines. The lists of recommended repositories of all 17 organizations were compiled into one list together with the lists of certified repositories (https://doi.org/10.17632/zx2kcyvvwm.1) to allow for further analysis. Based on the list of criteria that were used by the different organizations to recommend repositories, criteria were reorganized into 15 subheadings. After initial creation of the subheadings, we found some repetitions or scheme-specific criteria which we refined into 13 subheadings. The resulting list is the “Recommended Criteria Cluster” (Supplementary Table 1). Similarly, based on the list of criteria of certification schemes, we were able to create 14 subheadings. These were re-examined and after refining, 11 subheadings remained. These resulting 11 subheadings and their criteria form the “Certification Criteria Cluster” (Supplementary Table 2). In total, we found 242 repositories that were recommended by publishers, funding agencies, and/or community organisations, and the distribution of recommendations is depicted in Figure 2. A majority (88) were only recommended by a single organisation; ArrayExpress was mentioned most frequently, being recommended by 12 out of 17 organisations. 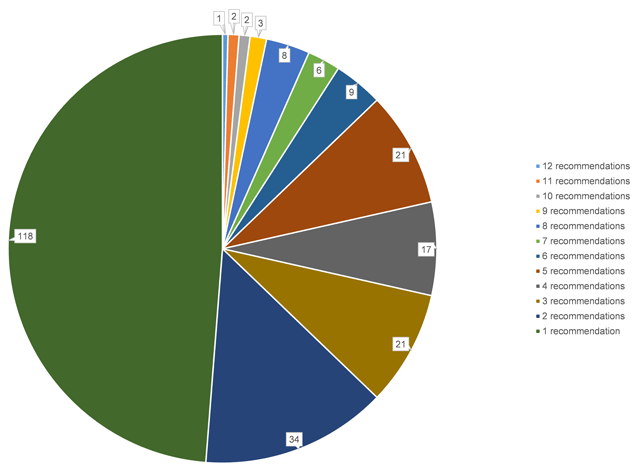 Pie-chart showing the number of repositories that are recommended by 1 to 17 organisations. The highest number of recommendations received is 12. When we look at recommended repositories with certification, only 13 out of 242 recommended repositories had any kind of certification: six repositories were certified by the DSA; six by the ICSU-WDS; none by NESTOR, TRAC, or TDR (Figure 3). Only one repository was certified by both the DSA and ICSU-WDS: the Inter-University Consortium for Political and Social Research (ICPSR). Of the 50 repositories that were recommended most often, only PANGAEA was certified. 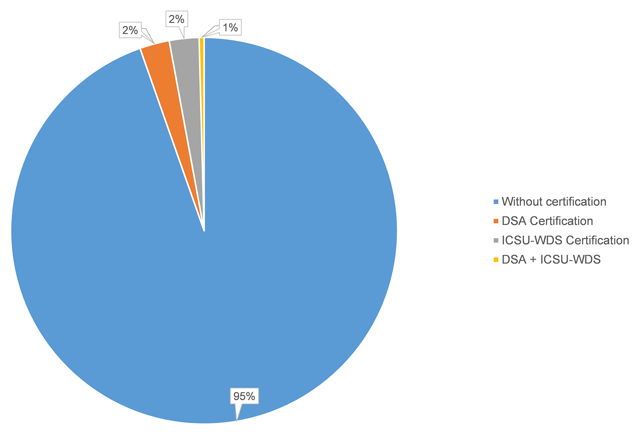 Pie-chart showing the percentage of recommended repositories that have obtained one of the following certifications: DSA, ICSU-WDS, and both DSA and ICSU-WDS. To arrive at broadly applicable terms we grouped the criteria and the broader categories of the Recommended Criteria Cluster and the Certification Criteria Cluster into seven recurring umbrella categories, listed in Table 1. Table listing 7 common terms, referred to as “umbrella categories”, based on a comparison between the Recommended Criteria Cluster and the Certification Criteria Cluster. The second column describes the shared meaning of the umbrella category, followed by differences in characteristics of recommended repository criteria and repository certification scheme criteria. When we looked at the discipline that each recommended repository covers, we found that that the most common focus discipline is Life Sciences with 115 repositories, followed by Physical Sciences with 80, Health and Medicine with 26, General/Interdisciplinary with 12, and Social Sciences and Economics with 9 (https://doi.org/10.17632/zx2kcyvvwm.1). To ensure long-term preservation of data. In comparing lists of recommended and certified repositories, we found a strong discrepancy: only 13 out of the 242 repositories that were recommended have obtained any form of certification. This gap between recommendation and certification can also be found in the fact that of the 50 most often recommended repositories, only one is certified. There are several possible explanations for the existence of a gap between recommended and certified repositories. Firstly, repository certifications find their origins in specific disciplines/domains. For instance, the DSA has a background in social sciences and humanities, NESTOR is formed by a network of museums, archives and libraries, and the ICSU-WDS mainly operates in the earth and space science domain (Dillo & De Leeuw 2015: 235–238). When looking at the different repository domains, we found that fifty of the most recommended repositories are linked to the natural sciences (life/physical/health sciences); exceptions in the top 50 are three interdisciplinary repositories. This depicts a contrast between repository domains and certifications’ target domains. Repositories operating within the life sciences domain might be less aware of certifications while conversely, certifiers might be tailoring standards that are less focused on the requirements for life science repositories. A second reason might be the dynamics in the field of data sharing; guidelines and practices are constantly evolving and being evaluated. While data repositories such as FlyBase have been active since the early 90s (Gelbart et al. 1997), certification schemes tend to be much more recent. The DSA is one of the oldest certifications, created in 2005 and becoming an internationally applicable scheme in 2009 (Dillo & De Leeuw 2015: 230). Changing data sharing dynamics are also reflected in the collaboration between certifying organisations and the merger of different guidelines. For instance, the partnership between the DSA and ICSU-WDS has brought together two certification schemes from diverse backgrounds and disciplines (Dillo & De Leeuw 2015: 237). Today, these schemes are still being developed and improved. The only certifications that have been obtained by the repositories in our analysis are DSA and ICSU-WDS. NESTOR has certified two repositories at the time of writing, none of which were included in the examined recommendation lists. Both TRAC and ISO 16363/TDR have not officially certified repositories. In the case of the TRAC guidelines, this is because they are ‘meant primarily for those responsible for auditing digital repositories […] seeking objective measurement of the trustworthiness of their repository’ (CCSDS 2011: 1), and are intended as a self-assessment check for repositories. The ISO 16363/TDR is a follow-up based on TRAC: it is an audit standard supported by the Primary Trustworthy Digital Repository Authorisation Body. Next to being considered a detailed way to evaluate a digital repository together with DSA and NESTOR (Dillo & De Leeuw 2015: 235), repositories can be ISO 16363/TDR accredited by the ANSI-ASQ National Accreditation Board, although so far this has not yet happened (Larrimer 2016). Another possible cause of the gap between certification and recommendation is that most organisations do not ask repositories for certification. From the five organisations used to create our Recommended Criteria Cluster analysis, only the RDA requires repositories to have a certification. The RDA states that a “trustworthy” repository is one ‘that untertake [sic] regularly quality assessments successfully such as Data Seal of Approval/World Data Systems’ (RDA). Organisations not asking for certification might provide repositories with little incentive to work towards the requirements of certification schemes. A limitation of this study is that we clustered the lists of all 17 organisations under the header of recommended repositories, but the way in which this recommendation happens differs. In some cases repositories are referred to by these lists as “supported” or “approved” (Elsevier, F1000Research), encouraged for their ability to make data reusable (NIH), meeting access, preservation, and stability requirements (Scientific Data/Springer Nature), having received funding or investment (BBSRC, Wellcome), or the list contains generally recognised repositories (PLOS). This can explain why overlap between the lists is limited, in certain cases, because different considerations might have played a role, depending on the intention of the organisation. We note that there might be additional lists available that were not found using our search methodology. The umbrella categories which we identified for data repositories indicate that publishers, community organisations and certification schemes largely agree on quality. Yet this is not reflected in the relationship between recommended and certified repositories. Out of the entire list, less than 6% of recommended repositories obtained some form of certification. Programmes such as the Horizon 2020 programme of the European Union tell their grantees that when choosing a repository ‘[p]reference should be given to certified repositories which support open access where possible’ (European Commission 2016), increasing the focus on certified repositories. This focus could create an incentive for repositories, in particular uncertified recommended repositories, to become certified. To ensure certification schemes are known to repositories, we suggest domains collaborate in creating or maintaining certification schemes. While we see the value in having different levels of certification, the recent DSA – WDS partnership provides a good example of a collaboration between domains. If repositories and certification schemes work together towards common standards, this can provide clarity and improve data management and quality. It would improve the data landscape if collectively, we make sure that recommended repositories are certified, and certifications are obtained by repositories that are being recommended. Further research into this area could involve looking at whether the criteria for repository certification have actually contributed to better data. It would be of interest to study if certification leads to more “FAIR” data, and whether data in a certified repository is more highly used and cited. Another possible topic of study is whether these criteria can be applied at the level of the dataset. This could also lead to the development of (semi-)automated tools to check whether datasets comply with the certification standards, before or during the process of submission of datasets to repositories. Our umbrella categories might help to develop the categories that datasets are judged against. As a final conclusion, we suggest that the seven common umbrella categories we identified could form a common ground for the standardisation of data repository requirements. These categories are multifaceted in meaning and could therefore support and improve data management, data quality, and transparency of the services provided by the data repository. Our results complement previous work by Dabratz et al., 2010 in which she concludes that general standards for repositories are complex, standards are used as guidelines instead, and that there is a need for a specific standard. Our umbrella categories could provide the basis for this standard. Therefore, we suggest that researchers take these criteria into account when choosing a repository, and suggest that recommending organizations consider converging on these standards. The authors are affiliated with one of the organisations keeping a list of supported repositories. Sean Edward Husen and Zoë G. de Wilde have contributed equally to this paper. BBSRC (n.d.). Resources. Available at: http://www.bbsrc.ac.uk/funding/apply/application-guidance/justification-resources/resources/ (Accessed January 27, 2017). BioSharing ((n.d.)a). Recommendations. Available at: https://biosharing.org/recommendations/ (Accessed January 18, 2017). BioSharing ((n.d.)b). Databases. Available at: https://biosharing.org/databases/?q=&selected_facets=recommended:true (Accessed January 27, 2017). CCSDS (2011). Audit and Certification of Trustworthy Digital Repositories. Available at: https://public.ccsds.org/pubs/652x0m1.pdf (Accessed: 28 October 2016). COPDESS (n.d.). Search. Available at: https://copdessdirectory.osf.io/search/ (Accessed January 27, 2017). CRL OCLC (2007). Trustworthy Repositories Audit & Certification: Criteria and Checklist. CRL and OCLC. Available at: http://www.crl.edu/sites/default/files/d6/attachments/pages/trac_0.pdf (Accessed April 7, 2017). DataMed (n.d.). Repository List. Available at: https://datamed.org/repository_list.php (Accessed January 27, 2017). DSA ((n.d.)a). About. Available at: http://www.datasealofapproval.org/en/information/about/ (Accessed January 18, 2017). DSA ((n.d.)b). Assessment. Available at: http://www.datasealofapproval.org/en/assessment/ (Accessed February 20, 2017). DSA ((n.d.)c). The Core Trustworthy Data Repository Requirements. Available at: https://www.datasealofapproval.org/en/information/requirements/ (Accessed April 7, 2017). Elsevier (n.d.). Supported Data Repositories. Available at: https://www.elsevier.com/books-and-journals/enrichments/data-base-linking/supported-data-repositories (Accessed January 27, 2017). EMBO Press (n.d.). Author Guidelines. Available at: http://msb.embopress.org/authorguide#datadeposition (Accessed January 27, 2017). European Commission (2016). H2020 Programme Guidelines on FAIR Data Management in Horizon 2020. Available at: http://ec.europa.eu/research/participants/data/ref/h2020/grants_manual/hi/oa_pilot/h2020-hi-oa-data-mgt_en.pdf (Accessed October 27, 2016). F1000Research (n.d.). Data guidelines. Available at: https://f1000research.com/for-authors/data-guidelines (Accessed January 27, 2017). Gelbart, W M et al. (1997). FlyBase: A Drosophila database. Nucleic Acids Research 25(1): 63–66, DOI: https://doi.org/10.1093/nar/25.1.63 Available at: https://www.ncbi.nlm.nih.gov/pmc/articles/PMC146418/pdf/250063.pdf (Accessed October 21, 2016). GigaScience (n.d.). Editorial Policies and Reporting Standards. Available at: https://academic.oup.com/gigascience/pages/editorial_policies_and_reporting_standards (Accessed January 27, 2017). ICSU-WDS (2012). Certification of WDS Members. Available at: https://www.icsu-wds.org/files/wds-certification-summary-11-june-2012.pdf (Accessed: 28 October 2016). ICSU-WDS (n.d.). Membership. Available at: https://www.icsu-wds.org/community/membership/regular-members (Accessed February 20, 2017). Larrimer, N (2016). ANAB Heads Up. Available at: http://anab.org/media/59172/hu327.pdf (Accessed October 28, 2016). NESTOR (2012). Certification Working Group. Explanatory notes on the nestor Seal for Trustworthy Digital Archives. Available at: http://d-nb.info/1047613859/34 (Accessed on 7 April, 2017). NESTOR Seal (n.d.). Available at: http://www.langzeitarchivierung.de/Subsites/nestor/EN/Siegel/siegel_node.html (Accessed February 20, 2017). NIH (n.d.). NIH Data Sharing Repositories. Available at: https://www.nlm.nih.gov/NIHbmic/nih_data_sharing_repositories.html (Accessed January 27, 2017). NIH (2015). NIH Grants Policy Statement. NIH. Available at: http://grants.nih.gov/grants/policy/nihgps/nihgps.pdf. NIH Data Science (2016). NIH Commons Overview, Framework & Pilots – Version 1. NIH Data Science at NIH. Available at: https://datascience.nih.gov/commons. PLOS (n.d.). Data Availability. Available at: http://journals.plos.org/plosbiology/s/data-availability (Accessed January 27, 2017). RDA, Repository Bundle (n.d.). Research Data Alliance. Available at: https://www.rd-alliance.org/group/data-fabric-ig/wiki/repository-bundle.html (Accessed January 27, 2017). Re3Data (n.d.). Re3Data.org|About. Available at: http://www.re3data.org/about (Accessed January 27, 2017). Scientific Data (n.d.). Recommended Data Repositories: Scientific Data. Available at: http://www.nature.com/sdata/policies/repositories (Accessed January 27, 2017). Springer (n.d.). Data policy – repositories. Available at: http://www.springernature.com/gp/group/data-policy/repositories (Accessed January 27, 2017). UK Data Service (2016). The “FAIR” principles for scientific data management. UK Data Service. Available at: https://www.ukdataservice.ac.uk/news-and-events/newsitem/?id=4615 (Accessed October 28, 2016). Web of Science (n.d.). Master Data Repository List. Available at: http://wokinfo.com/cgi-bin/dci/search.cgi (Accessed January 27, 2017). Wellcome Trust ((n.d.)a). Policy on data management and sharing. Wellcome, Available at: https://wellcome.ac.uk/funding/managing-grant/policy-data-management-and-sharing (Accessed January 27, 2017). Wellcome Trust ((n.d.)b). Data repositories and database resources. Available at: https://wellcome.ac.uk/funding/managing-grant/data-repositories-and-database-resources (Accessed January 27, 2017).